At the start of the 19th Century there were only a few stores selling fur and they were very exclusive; only the wealthiest people could afford to buy fur garments to wear on a day to day basis. As the fitted fur jacket came into fashion in the mid 1800s stores started to sell good quality fur at more reasonable prices and department stores sold very cheap fur accessories and trimmings. 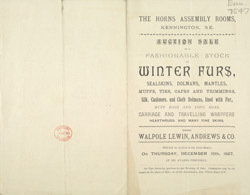 Fur was also sold at auctions like the one featured on this advert in the Horns Assembly Rooms. It became very fashionable to wear ‘whole animal’ garments like squirrel muffs and fox stoles. At the end of the 19th Century, an anti fur movement was started to encourage the use of imitation fur.